One of my resolutions this year is to waste less food. I’ll admit, I can get carried away and cook like I’m feeding an army, when in fact we’re only 3 people who live in this household. When I think about the manpower and natural resources that go into growing food and raising livestock, it is just irresponsible to use more than we need then let it go to waste. And in these tough economic times, being responsible about our food is all the more important. I realize our family is fortunate to be able to afford to put a variety of nutritious food on the table as well as enjoy a nice dinner out once in a while. With a lot of attention being (rightly) paid to worldwide hunger, it’s easy to forget that there are people who are hungry here in our own backyards. Families struggling to put food on the table. Seniors who have to decide whether to buy medicine or food. It doesn’t really matter the situation, no one should go hungry in Oregon, in American or anywhere else. When I heard Oregon Food Bank was launching Blog for Food, I knew right away I wanted to participate. OFB is not just about collecting food at local food drives. They work with a variety of sources, like farmers, wholesalers, retailers, manufacturers and government entities, to collect and distribute food to regional food banks throughout Oregon and southern Washington. The food they collect supplies missions, soup kitchens and families in need with nutritious food. But recovering and distributing food is only the beginning. They want to eliminate the root causes of hunger by providing nutrition education, advocacy, and working with people to teach them how to grow food in their learning gardens. I encourage you to check out their website to see what OFB is all about, why they need our help and find out other ways to help. To keep up their massive effort, it takes not only food, but also money. Through the Blog for Food campaign, they are hoping to raise $5000 in the month of February. Considering they are facing increasing demand, it’s a modest sum to help support an extraordinary effort. Donations don’t have to be extravagant to make a difference. Think, if just 1000 people donate $5 each how quickly we can reach the goal! Click on the logo up top or in the right sidebar to go to OFB’s online donation page. 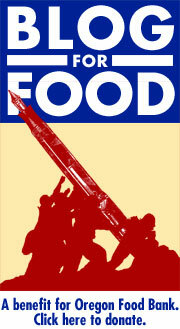 Be sure to enter “Blog for Food” in the tribute section so the donation is counted towards the campaign. If you prefer, donations can be sent to Oregon Food Bank, PO Box 55370, Portland, OR 97238-5370. Of course, OFB always welcome food donations. Please read the donation guidelines to be sure the food you donate can be accepted. Click here to find a drop-off site near you. In addition, during the month, food donations can also be dropped off at Saraveza at 1004 N. Killingsworth. We donate money to our local Food Bank every year. They need our help now, more than ever. And it's amazing how many meals can be provided for just a little donation. It breaks my heart to think of people without food, especially families trying to feed their children. qgirl, I feel the same way. I volunteer at a high school for at-risk youth. Several of them have to basically look after themselves and the one sure meal they get is school lunch. Otherwise, it's eat whatever you can get your hands on. Darlene, This is such a wonderful post. Your words regarding what it takes to produce the food, and the importance of being responsible about our food is so well written ... I'm certain I'm going to reference in multiple conversations. The Oregon Food Bank does such wonderful work. I imagine they are being inundated with assistance requests. The concept of Blogging for Food is so very creative, and provides such an easy opportunity for community service. I hope it is a tremendous success. There's just no reason for anyone to go hungry. There's a similar program I see at the check-out counter of the grocery here in New Jersey-- though I'll need to look up their specifics (what their plans are, etc.) I wish the OFB success in their target this month!